The Tom Lee Music Piano Service Department provides regular Piano service such as tuning, regulation and voicing, plus minor finish repairs. We provide Vancouver Lower Mainland Piano service from Monday to Saturday, between 9 am and 5 pm, with additional times available outside of these hours by request. Our local Vancouver Lower Mainland piano service area covers West Vancouver to Langley, and the North Shore to White Rock. Piano Service on Vancouver Island may be arranged through the Managers of the Victoria and Nanaimo Showrooms. Our commitment to our community is to exceed our client’s expectations - not only now, but long after our client has selected Tom Lee Music for all your musical needs. For more information regarding our Vancouver Lower Mainland Piano service, please phone our Piano Service Coordinator at 604-273-3800 (extension 223) or visit any of our eight piano showrooms. If you would like additional information regarding normal Piano maintenance, we would be pleased to mail you our "Piano Owner's Manual & Service Record" brochure. To request this informative brochure, please phone any of our nine Piano Showrooms, or our Piano Service Coordinator 604-273-3800 (extension 221 or 223). The Tom Lee Music Piano Service Department provides regular Piano Service such as tuning, regulation and voicing, plus minor finish repairs. We provide Vancouver Lower Mainland Piano service from Monday to Saturday, between 9 am and 5 pm, with additional times available by request, outside of these hours. Our Piano Technicians have had extensive training in either finish repairs and/or regular piano service such as tuning, regulation, and voicing. 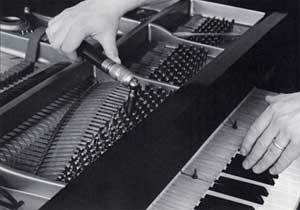 Many have had Steinway, and/or Yamaha, and/or PianoDisc factory training. They prepare and service the grand and upright Pianos we provide for the many Festivals, RCM exams, Recitals and Concerts throughout every year. Many of our Piano Technicians have had over 30 years’ experience in piano service and customer care. If you would like additional information regarding normal Piano maintenance, we would be pleased to mail you our free "Piano Owner's Manual & Service Record" brochure. To request this informative brochure, please phone any of our eight Piano Showrooms, or our Piano Service Coordinator 604-273-3800 (extension 221 or 223). 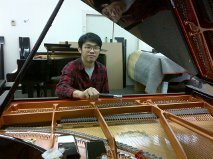 Simon Wu is Tom Lee Music’s Head Retail Piano Technician, and he is an RPT (Registered Piano Technician). His love with piano technology started early on, while working in a piano factory in China. 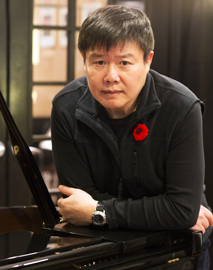 Since moving to Canada and joining our company in 1990, he has acquired an in-depth knowledge and experience with the world’s major piano brands. Simon has more than 30 years’ extensive experience in the service field, and is highly respected in the community and throughout our industry. He loves classical, jazz, and country music, and in particular he loves string music (he plays the violin). Simon is an avid dog lover! 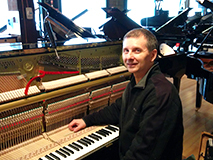 Bob Bjerke has proudly served in the Tom Lee Piano Service department for over 20 years. He is a graduate of the Douglas College Piano Technology program and has over 31 years of professional experience working in piano technical services. He is currently an associate member of the Piano Technicians Guild and a member of the Canadian Association of Piano Technicians. Bob has received extensive factory training through Steinway and Sons and Yamaha. He has tuned pianos for the Burnaby Clef Music Festival, South Fraser Music Festival, Kiwanis Music Festival, North Shore Music Festival, Music Fest Vancouver, TD Vancouver International Jazz Festival, Envision Jazz and the Chopin Society Concert Series. His fine work was also utilized at the Knigge Piano Competition, Canadian Music Competition and the Pacific Piano Competition. Additionally, Bob has served as a piano technician for the Langley Community Music School, Kwantlen College and CBC. A sampling of his clients includes Yulianna Avdeeva, Brian Adams, Dave Brubeck, Yefim Bronfman, Victor Borge, Jane Coop, Chick Corea,Ray Charles, Bella Davidovitch and Misha Dichter. 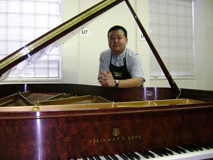 Vincent Huang is one of our all-around Master Piano Technicians. He has acquired extensive knowledge, skills, experience in piano service and customer care over many years. Vincent was trained by Yamaha (Taiwan). 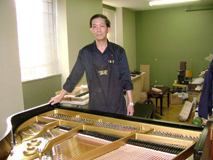 He is an expert in tuning, piano repairs, cabinet work and refinishing. Vincent is a dog lover, likes classical music, and is studying Chinese cooking. Tad Iwagami is one of the top graduates from the exclusive, intensive one-year training program at the internationally acclaimed Yamaha Piano Technical Academy in Japan. 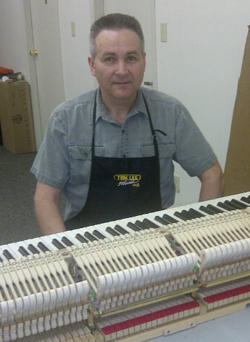 He is the only certified piano technician in Canada who has completed this program. He has also trained at Steinway & Sons in New York. With over 25 years of experience in the piano service industry (17 of which with Tom Lee Music in Vancouver), Tad is one of Tom Lee Music's master concert technicians. He has tuned pianos in various events including concerts, music festivals, piano examinations, competitions, and for private customers. He is an excellent aural piano technician who does not depend on any tuning-assisting devices such as tuning scopes, meters or software. Click here to view Tad's Certificate of Achievement. Natalie has worked full-time as a Piano Technician with the Tom Lee Music Piano Service Department for 15 years. 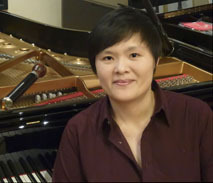 She graduated with a Diploma in Piano Technology from the George Brown College in Toronto in 1998. Natalie has also received extensive factory training at Steinway & Sons. She was interviewed by the Ming Pao Newspaper in the feature article "My Job, My Say". Natalie is an associate member of the Piano Technicians Guild (PTG) and has been a piano technician for countless Music Festivals, RCM exams, Recitals, Concerts, and loves to perform in-home piano care and service. Kevin is currently our youngest Piano Technician, yet he is well-trained and is fast becoming a high level piano technician. He is a graduate from the Western Ontario University Piano Technology program. Kevin is gifted in tuning, regulation, and voicing pianos. He has also been trained by Yamaha in Disklavier technology, and by PianoDisc as an installation technician. Kevin plays piano, violin and bass guitar. Matthew has been a passionate piano and violin instructor since 2005. With his love for pianos, he decided to pursue becoming a piano technician. Since his graduation from the Piano Technology program at Western University, he has joined our family at Tom Lee Music as a Piano Technician. Matthew has received extensive training from Steinway and Yamaha and is rapidly becoming one of our top technicians. He is currently in charge of our Steinway Spirio pianos. With a background in music and the visual arts, Michael Ryznar has always had a passion for creativity and technology. He studied classical piano in his youth and has completed his grade ten certification with the Royal Conservatory of Music. Over the years he has worked as an organist, piano teacher and more recently a piano accompanist for his daughter who plays the violin. With an interest in woodworking, Michael has worked as a piano cabinet technician for Tom Lee Music and is currently apprenticing as a piano tuner. Michael holds a diploma in Graphic Design from Emily Carr College of Art and Design and has been a member of the Graphic Designers of Canada professional association. In his spare time, he enjoys painting, art history and all forms of music. 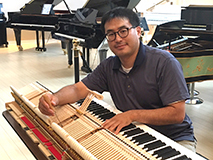 Jay Kim previously worked at a piano restoration store in Korea where he became proficient in piano technical services including tuning, regulation, voicing, repair and cabinetry touch up. 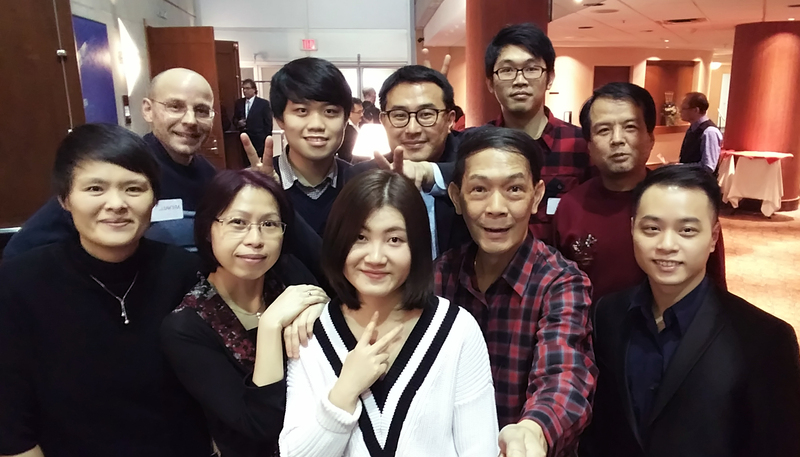 Through his extensive work experience, Jay was accredited as an Industrial Engineer Piano Tuner, the national technical qualification of South Korea. He later went on to run a private business for several years before moving to British Columbia. Jay is also an accomplished academic with a Bachelor of Music Degree in Voice Performance from ChuGye University for the Arts and a Master of Music Degree in Choral Conducting from Presbyterian University and Theological Seminar. For over a decade, he proudly led municipal choir members as a church music choir conductor in Korea. Chris Keller is a professional piano technician with more than thirty years of exceptional experience. He has tuned pianos for numerous celebrities including Aretha Franklin, B.B. King, John Legend, Elton John, Billy Joel, Tony Bennett, Bryan Adams, John Fogerty, Tears for Fears, The Righteous Brothers and more. Chris began his career in 1984 as a piano technician in Brandon, Manitoba under the mentorship of his father Frank Keller and Richard Creasy of Creasy's Pianos. Chris successfully serviced pianos throughout Western Manitoba, expanding to Winnipeg, Western Ontario, Dauphin, Swan River, and Eastern Saskatchewan. He later moved to Vancouver where he professionally tuned and serviced pianos for nearly a decade. In 2000, Chris moved to Kansas City where he received Yamaha and Steinway training through Schmitt Music. His duties included servicing the Steinway and Yamaha inventory of more than 200 new and used pianos. Chris finessed his skills in fine regulating, tuning and voicing which lead him to become the exclusive technician for upscale Kansas City venues such as the Midland Theatre and the Ameristar Casino. 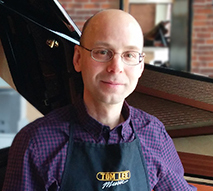 Chris returned to Canada in 2010 and now resides on the North Shore where he provides quality piano care for Tom Lee Music stores and patrons across the lower mainland.